Recently, I made Peter Reinhart's Italian Bread into soup bowls. 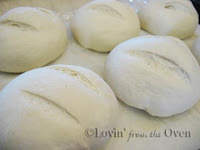 This has been my all time favorite bread as part of the BBA challenge. 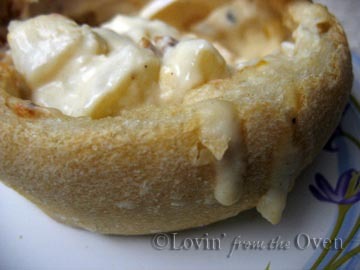 My husband firmly believes soup needs to be in a bread bowl in order for it to be a "meal." Take your favorite bread recipe and divide them into 6 oz. portions. This Italian Bread recipe easily makes six bread bowls. This was the perfect size for a ladies function. Gently shape each portion into a ball, stretching the outside and tucking the edges underneath. Let the dough rest for 5-10 minutes. 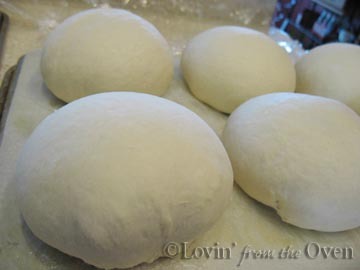 The dough will relax and the pinched part of the bottom will come apart. Bring the edges of the dough together again. This is creating surface tension. 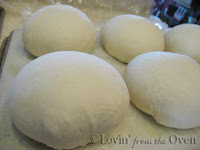 Surface tension allows your dough to rise up instead of out. After the dough has risen, it is slashed (I use a tomato knife) and put into a hot 500ºF oven. To create a crispy, artisan bread crust, take a spray bottle filled with water and quickly mist the area over the dough (don't mist any light bulbs or glass!) Shut the oven door; wait 30 seconds, and quickly mist again. Close the oven door, wait 30 seconds and mist one last time. Close the oven door. Turn the temperature down to 400ºF and cooked them for 20-25 minutes, creating a thicker crust to hold the soup. They were perfect. The right size, texture and flavor. Twelve of these bowls were quickly enjoyed with soup by several ladies at a church function. I am sooo stealing this idea! (Will give you all the credit of course.) I seriously can't wait to try this. Steal away, Mags! You will love them! 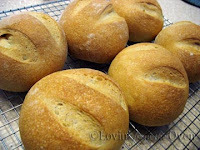 I've been looking for a bread bowl that actually WORKS (doesn't turn out flat) Great hint for making them stand at attention... Great post - I'm excited to try these! These look SO GOOD. I've been working on a huge pot of soup for the past few days and bread bowls would make it so much better! YUM! what is a water spray at 500 degrees? Can you explain that better? Adelele, I fill a spray bottle with water and mist the area over the top of the bread. This creates steam, which in turn, gives your bread that crisp, crackly artisan bread type crust. Thanks for the question...I'm editing my post right now!